All bookings made with Hooked on Cycling (Partners J. Hook, S. Hook, S. McCue, N. McCue, S Hook) are made subject to these Booking Conditions. When you pay your deposit, you are making an offer to purchase our services or holidays, which, if accepted by us, will result in a binding contract. Payment of your deposit does not constitute our acceptance of your offer and your deposit will be refunded in full if your offer is refused. Once your holiday has been confirmed we will accept responsibility for it in accordance with these conditions as an “Organiser” under the Package Travel, Package Holidays and Package Tours Regulations 1992. Your holiday contract:When you make a booking, you guarantee that you have the authority to accept and do accept on behalf of your party the terms of these booking conditions. A contract will exist as soon as we issue our confirmation invoice. This contract is made on the terms of these booking conditions. 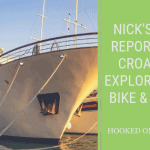 A deposit of 200 pounds per person (£250 for bike and boat trips at sea and 30% of holiday amount for bike and barge trips) is required at time of booking. The balance of the full holiday cost is due 10 weeks (70 days) prior to your holiday start date. If the balance is not received by the due date we reserve the right to cancel your booking and apply the cancellation charges as detailed in paragraph 4 below. When bookings are made less than 10 weeks before the start of your holiday, full payment must be made when booking. Prices quoted in this brochure are in pounds sterling. Hooked on Cycling reserves the right to alter any prices at any time before your holiday is accepted. If at time of booking the price is different to that in our brochure or website, you will be advised the revised price applicable before the booking is accepted. It is unlikely that we will have to make changes to your travel arrangements, but we do plan arrangements many months in advance. Occasionally, we may have to make changes and we reserve the right to do so at any time. Most of these changes shall be minor and we shall advise you of them at the earliest possible date. We also reserve the right in any circumstance to cancel your travel arrangements. For example if the minimum number of clients required for a particular trip is not reached, we may have to cancel it. However we will not cancel your trip less than 8 weeks before your departure, except for reasons of Force Majeure or failure by you to pay your holiday balance. If we need to cancel your holiday we shall offer either an alternative Hooked on Cycling & Walking tour at similar cost or a full refund. We will also pay to you compensation as set our below. We cannot accept liability or pay compensation where the contract (booking) is affected by ‘force majeure’. In the context of these terms and conditions, ‘force majeure’ is any event that we could not, even with due care, foresee or avoid. These events include but are not limited to war, threat of war, flood, explosion, sabotage, riot, civil commotion or strife, hostilities, industrial dispute, natural disaster, fire, terrorist activity, nuclear disaster, adverse weather, government action, unavoidable technical problems with transportation or other events outside our control. If you need to make alterations to your holiday after your deposit has been received and accepted by Hooked on Cycling we shall do our utmost to help, we do however charge an administration fee of35 pounds per person. (£35 GBP per person) Alterations inside 10 weeks before departure would in effect be a cancellation and re-booking. For your security Hooked on Cycling complies with the EU travel package directive. It is a condition of booking that clients have adequate insurance with a reputable insurer to cover personal injury, medical expenses, repatriation expenses, loss or damage of luggage and its contents and expenses associated with cancellation or curtailment. The client is responsible for any loss or damage to baggage, bicycles or personal possessions or any consequential loss resulting there from. Hooked on Cycling accepts no responsibility for loss or damage to baggage, possessions or bicycles while in transit with us or our partners. If a client becomes ill, all hospital expenses, doctors fees and repatriation costs are the responsibility of the client and Hooked on Cycling shall not be liable to a refund of tour cost. We do our utmost to ensure you have an enjoyable holiday. If you have any problems, please contact us or our partners immediately and we shall do our best to resolve them. Any complaints should be notified to us as soon as reasonably possible and in any event notified to our office within 28 days of the end of your holiday. Clients must ensure they have or plan to have adequate fitness to enable them to complete their chosen tour. Hooked on Cycling cannot be held responsible for breakdown of client’s own cycle. In the event of a breakdown which results in a tour not being completed Hooked on Cycling shall not be liable to refund any tour cost. In the event Hooked on Cycling will do their best to help get the client to the next hotel or back to the start location. Any cost incurred shall be the responsibility of the client. If a bike is hired from Hooked on Cycling full emergency backup to severe mechanical breakdown is provided. The information contained in our brochure or website is to the best of our knowledge correct, all information is subject to alteration without notice. Hooked on Cycling accepts no liability for any inaccuracy in the information produced. If the actions of you or your party cause damage to accommodation or property of a third party or cause accident on the highway you agree to indemnify us against any claim (including legal cost) made against us by or on behalf of the owners of such accommodation or property or resulting accident. Hooked on Cycling cannot be held responsible of the conditions of the highway or trials or for other users of such routes which are included in our tours and at all times you take part in your chosen activity at your own risk. When the tour is developed, we carry out a risk assessment on the roads and trails we recommended for travel. We cannot be held responsible however of the upkeep on the condition of these roads and trails. If you believe adverse weather or for any other reason a road or trail is unsafe to follow please contact us without delay. On our group tours we share departure dates with other European Companies and therefore cannot guarantee the composition of a group in terms of nationality, age, singles or couples. Any guide will always speak English. Group and guided tours may need a minimum number of participants to start, if this number is not achieved you will be notified 8 weeks prior to start of the tour. The minimum number required will be included on your confirmation. On a guided trip if numbers are not achieved we may still go ahead with the trip at our own discretion. Our bikes are checked regularly. The customer should check the bikes before use and bring any problems to the attention of the company before use. On our self-guided tours the maps and route directions provided are for guidance only. We cannot accept responsibility for any inaccuracies of the published material which you will receive, to the best of our knowledge, was correct at the time of printing. Hooked on Cycling are not responsible for any extra costs incurred if any public transport is cancelled. We do our utmost to ensure any public transport timetables are up to date in our tour material but it is the responsibility of the guest to check local information on day of travel for current travel times. When available official accommodation grading is provided. If not available Hooked on Cycling will grade the accommodation based on our experience, in this case our judgment is final. 1 piece of luggage per person not heavier than 20kg is permitted on our tours. More or heavier pieces of luggage may be refused carriage or a local supplement may have to be paid. 23 These conditions and any contract to which they apply are governed in all respects by Scottish Law with jurisdiction of the courts of Scotland, you may however choose the law and jurisdiction of England or Northern Ireland if you live there and wish to do so. 24 Your specific passport and visa requirements, and other immigration requirements are your responsibility and you should confirm these with the relevant Embassies and/or Consulates. We do not accept any responsibility if you cannot travel because you have not complied with any passport, visa or immigration requirements.